Many people are surprised by the strength of this incredible man and they are always asking him what is his secret. 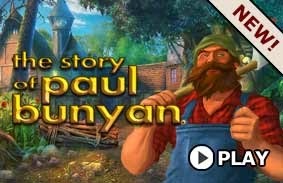 In his story Paul reveals us that many years ago, when he was much younger, he was helping his father when they found a magic ax in the woods. This magic ax gave him supernatural power and that power allows him to cut and collect more woods in the forest so that's how he is in a great advantage over the other carpenters. Since he manages to collect more woods, he is also able to collect more money and be better than any other carpenter... but let's see this story from his sight of view.